Hestia (pronounced hess;tee-ya) represents purity, sincerity, sanctity and safety. She is associated with the warmth and comfort of the welcoming fireplace and was the oldest daughter of the Greek Titans Cronus and Rhea. As one of the twelve Olympian gods, her name can also mean the heart, and relates to the place in the house where the fire is maintained. As such, she was the keeper of the sacred fire on Mt. Olympus. Although her Roman counterpart, Vesta, symbolized celibacy, Hestia’s energy resonates more with a desire to place spirituality above sensuality. and with its hearth fire lit, making it a home. 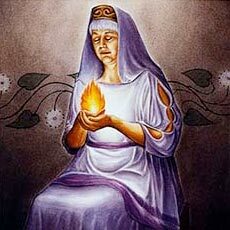 Hestia was the Goddess of the sacred fire, was once known as “Hestia, First and Last”. Being the first born, and also the last, takes sa bit of explaining . . .She was the first child the Titans, Cronus & Rhea. Cronus, made fearful by a prophecy that one of his children would grow up to usurp his throne, quickly swallowed the infant Hestia (as he did the brothers and sisters that followed) in order to prevent the fulfillment of the prophecy. Later, following the birth of Zeus, the grieving goddess Rhea tricked her husband into swallowing a rock wrapped in swaddling instead of the infant, causing him to vomit up all the babies he had swallowed. As she was the first in, Hestia was the last to be disgorged. Even though she was one of the most influential and widely revered of the Greek goddesses, she (like her counterpart, the Roman goddess Vesta) is virtually unknown today. And unlike all the other goddesses, she was not depicted in a traditional female form. She was more of a presence, a feeling, an essential energy of warmth and protection. In Greek art, she was depicted on red figured vases wearing a veil and holding a scepter or flower, sometimes seated, sometimes standing, but always in a pose of immobility. The Goddess Hestia possesses an introverted temperament and is focused on her inner, spiritual world. As such, she is an archetype of inner centeredness. She was known to be mild mannered, upstanding, charitable, as well as a protector. She is probably the least known of the Olympian goddesses primarily because she never took part in any disputes or wars. She minded her own business amidst a family of goddesses and gods who engaged in high drama. Similarly to Athena and Artemis, she resisted the amorous advances of men, which places her in the virgin goddess category. Her energy is impersonal and detached. Her awareness is focused. Different than Persephone who seeks to please others, Hestia’s focus is for herself. She is grounded and her life has meaning. Unlike Athena and Artemis, Hestia did not venture out to explore the world or wilderness, she remained inside, contained within the hearth. The goddess, Hestia did not take a partner. A Hestia-type woman, today, may prefer to live a more solitary life or live within a community of like-minded, spiritual ‘sisters’. 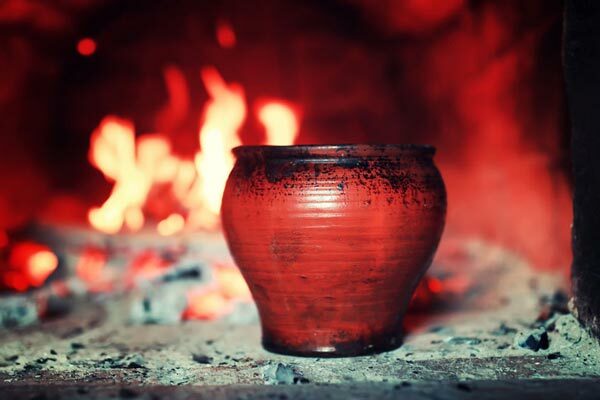 Just as the flames glowing from the hearth soothe us with their warmth and glowing light, the Goddess Hestia gives us security, peace, and comfort and helps us accept the truth of our lives with inner grace.